Here at Lockaway Storage, we know our success is due to our wonderful team. The care they give our renters is unparalleled and we want to highlight their milestones along the way. Below is an interview with Jake Price, who is celebrating his 1-year anniversary with Lockaway Storage. 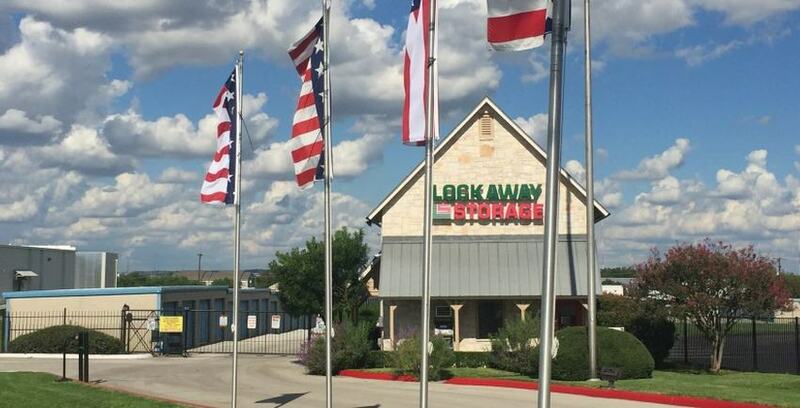 You can meet Jake at Lockaway Storage on Harry Wurzbach Road in San Antonio, TX. Shannon: So you are celebrating your first year with Lockaway Storage, correct? Jake: Yes, ma’am. It sure is. Shannon:What were you doing a year ago? Besides starting at Lockaway, what kind of job did you have? Jake: I'm retired from public schools. I was a teacher, a coach, and a counselor, and an administrator for 24 years. Shannon: Well, that's a lot! So what did you teach? What were you a coach of? Jake: I was an all level special education teacher that taught all subjects. Then I was a coach, I specialized in all different sports. I did soccer, girls volleyball, basketball. I specialized my undergraduate degree in exercise science and biomechanics, so I specialized in strength training and agility. We want to make sure that the kids are safe, knowledgeable, and strong during their athletic endeavors. Shannon: What ages did you teach through? Jake: I did coach for a little while for elementary, but that was like trying to herd cats. My nerves lasted for about 2 years. I started doing middle school and moved up to high school, so that was really cool because you get to connect with people and watch them grow and you also get to watch their character develop along with their sense of movement. The community of the team and the school made for a lot of community pride. It was pretty cool. “Jake has been great to work with and learn new things from. Jake has probably the best customer service I have ever seen. It's been a pleasure working with him." Shannon: When did you retire? Jake: I just retired in May of 2017. Shannon: What made you decide to go in to self storage after retiring from all of that? Jake: My grandfather on my dad’s side was a Texas Ranger, so we all grew up managing ranches and fixing houses. I'm no longer married, but while I was married I managed seven different properties. My house, my parents house, and then we had rental properties. On mom's side of the family my grandmother builds houses, so it just made sense to go into property management. It was kind of a natural flow. Shannon: Yeah, it sounds like it. Since you had previous experience in property management, there probably wasn’t too much that surprised you, but was there anything specific to self storage that you didn’t know going into it? Jake: That’s a great question, and I would say the legality of it. Although you are renting people space to put their things in, it’s kind of a whole different legal venue than it is when you’re renting an abode. It’s kind of a different way to connect with customers too. Whenever I was managing rental properties, often times they would just send me a check or call me if something needed to be done, or I would come by for regular maintenance. With this, you kind of get the opportunity to talk in more depth with people about their things. And not just arbitrary things, it's belongings and pictures of deceased loved ones, and history. I had a lady who was 104 years old that lived over here at USAA Towers, and she would write checks and write letters to us and that was really cool. So it's history too. Shannon: Wow that’s really cool! What do you think it takes to be successful with a company like Lockaway Storage or just in self storage in general? Jake: I would say to the new people listen with your heart and always put the customer first. On our wall is the acronym “STRAT” the first T stands for “Treat others how they want to be treated”. This notion is such a paradigm shift. If people want to move through then move them on through. But if people want to talk, then try to talk to them for a minute. Like this interview, this is a way to tell about yourself to people who are interested. It's a cool opportunity. Even though this is property management and sales, we are people driven. It’s important that you develop that trust and genuinely care about people and listen to them. So yeah, I think that's the biggest thing for me anyway. “When we came across Jake, his talent and professionalism were unmistakable. His work ethic and people skills are phenomenal, and his positivity aligns seamlessly with SPMI's STRATitude culture. We are very fortunate to have someone of Jake's character and diverse background on our team!" Shannon: Over the past year, is there anyone that was especially helpful in answering questions you’ve had? Would you like to give them a shout out? Jake: Golly, first and foremost thanks to Mason Anderson, he's been the Assistant Manager that works multiple stores, so he helped me out with the daily grind and all the paperwork and new systems and old systems. Especially thank you to, I'm going back in time, Jason Steitle who did all the training and there's a lot of different stuff in this 33 billion dollar industry. He kind of just gave me the down and dirty on all things I would need, and let me figure out the rest. What he dumped into my head in terms of contracts and all of the daily checklist and cash drawer and lots of different stuff, he was totally awesome. Thank you to Carlos Morales and Danny Rios, in Maintenance, too! These guys help all thirty-one stores and have always done so much to help us here. Thank you to District Manager Amy Medrano who was there for the big picture issues, and thank you to our CEO Don Clauson for coming by and making his presence known. I want to thank Tristina Volesky, Brand Vice President, who's come across at a high level on all of those issues as far as valuing my opinion and I appreciate her giving me the opportunity to look at this awesome new website that's totally next level, and letting us old farts give our input to it, so that's really cool. It’s very much appreciated. Shannon: That's fantastic! For my last question, I want to focus on what you do outside of work. Do you have any hobbies or family you hang out with? Jake: I do quite a bit. I continue on trying to learn new things. I play several instruments: guitar, harmonica, mandolin, and I mess around a bit with the piano. I practice martial arts, I was originally in Taekwondo in high school. I now practice a form called Kajukenbo which is Karate, Judo, Kenpo Karate, and Kung Foo all mixed up. Yeah, it's kind of cool. They have a mantra that says “through these fists come a happy life”. I also try to work out regularly, and I take care of my parents. Both of them are aging and my dad's disabled. Yeah, all that keeps me pretty busy.